Growing an apartment garden is rewarding but somewhat unpredictable. I’ve had mixed results from year to year. I wanted to have a way grow fresh food with very little space and in a short time with almost certain results. That is why I decided to try sprouting. Seeds are rich in vitamins A, B-complex, C, and E, and the sprouting process increases the nutrition value. 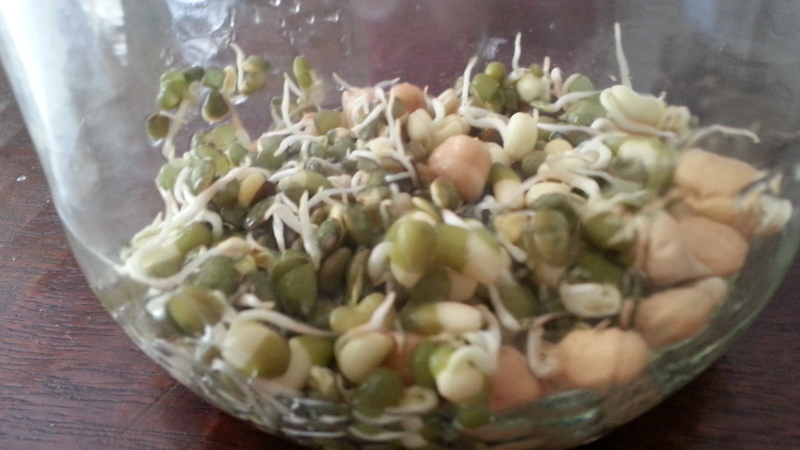 Sprouts are also high in minerals such as calcium and magnesium. In recent years, may supermarkets have opted against carrying sprouts. I needed bean sprouts for a recipe not too long ago and was surprised to find out my corner market didn’t carry it. Alfalfa sprouts were missing as well. The produce manager said they did not like carrying sprouts due to the risk of contamination. Two other stores I visited did not stock them either. I ended up picking up a pre-packaged bag of bean sprouts at Whole Foods and it was not cheap. 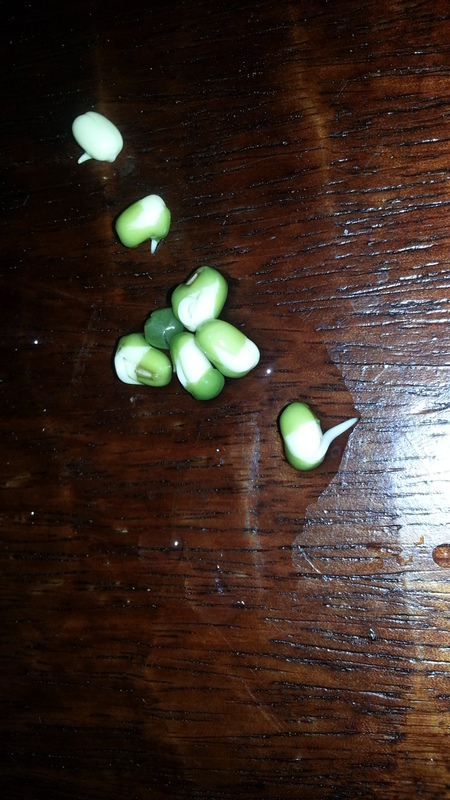 I bought the sprouting seeds from Amazon. I chose a mix with mung beans, lentils and chick peas. rubber band to secure the coffee filter to the mouth of the jar. I know you can buy special sprouting jars but I wanted to try it without spending additional money. 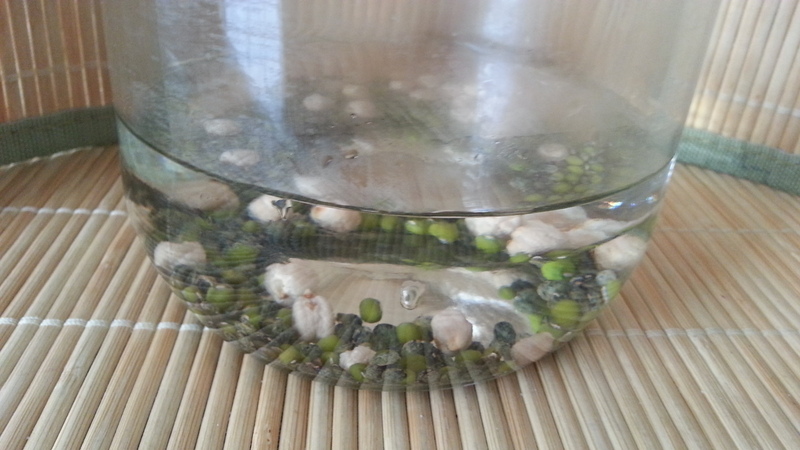 Day 1: Soak the seeds in water overnight. Day 2: Rinse the seeds well and drain. I just used my hand to keep the beans from falling out. Cover with the coffee filter and secure. Leave it alone in a clean, well-lighted area. Repeat the rinsing process in the afternoon. Day 3: Rinse the seeds once in the morning and once in the afternoon. By now all the seeds had sprouted. I did a quick sniff to make sure they smelled fresh and were not going bad. Day 4: Repeat the process and saw the sprouts had a bit of green leaves on top and I worried I left them too long. After reading a few sprouting sites, I determined they are perfectly safe to eat at this point. It was interesting to see the the sprouts I grew were not nice and straight like the sprouts sold at the market. These sprouts curved all over the place. That’s because the commercial ones are grown in sprouting boxes that allow the shoots to go straight up. I decided to cook the sprouts instead of eating them raw. I am not big on putting sprouts in salads, plus, being new at this, I felt it was safer to cook them. First, I washed and drained the sprouts. I also double checked to make sure they continued to smell clean. I heated a tablespoon of coconut oil in a pan. 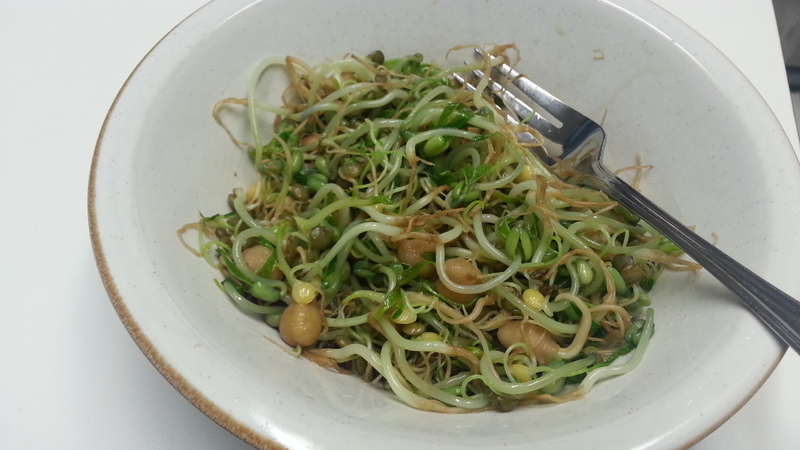 Once the pan was hot, I added the sprouts and sauteed them with a tablespoon of soy sauce and a dash of pepper. After about two minutes, they looked ready. I tasted the cooked sprouts and they had a pleasant taste. I wouldn’t go as far as rave that they are “absolutely delicious” but they didn’t taste bad either. I’d say they taste just fine and made a good, healthy lunch. Yes, I would. I think they would taste good added to stir fries and possibly some ramen noodles. Lots of people eat them raw, but cooked is my preference. The container would have to be thoroughly cleaned and sterilized before making the next batch. After trying this out, I am convinced seeds for sprouting would be a good addition to the emergency food storage. 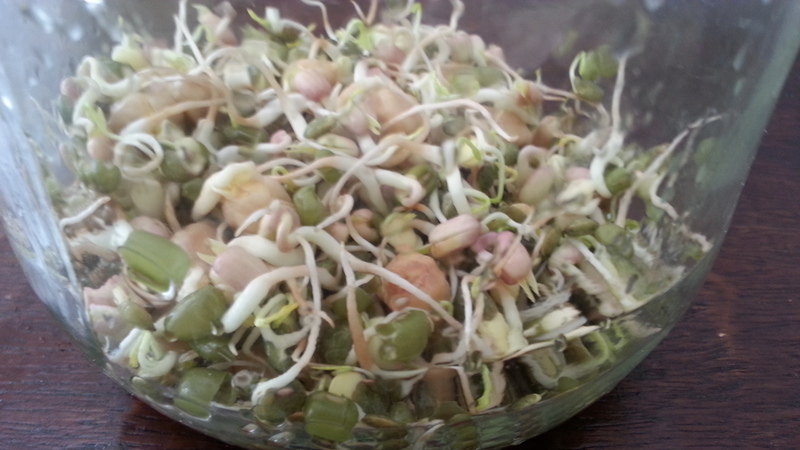 Sprouting is also a good skill to have in terms of increasing your self-sufficiency. Save your self the PIA Factor on using coffee filters—get a sheet or more of the Plastic Needle Point Canvas and cut your own drainer lids. Just trace the inner dimension onto the canvas (plastic perforated with small holes) and fit it into the ring from the canning jar—make sure it is a trifle over sized to get it to STAY in the lid so when you turn it over to drain it does not spring a leak or —worse!—fall out. Easy to cut with regular scissors. This way you can get many lids for many jars for a few cents or you could experiment with different boxes etc. Just rinse them when done and drain. You can find single sheets of this stuff at places like JoAnnes Fabrics for around a dollar or a pack of them for around $2-3 at Walmart. A tip to get a better yield—after you rinse and drain lay the container on it’s side and shake til the seeds are on the bottom side distributed along the length. They seem to sprout better and yield more this way; less competition I think! We even do sprouted sunflower seeds for our chickens this way in a large 1/2 gallon Mason jar. Also–Mason jar rings and flat lids can be used on many other jars for storage or sprouting etc. And you can buy at WalMart etc plastic solid lids–not for canning!—for storage—these can be completely reused and seal better than the metal lids that come on other jars. Hi Judith, Thanks for the tip! I will have to try it.